We all agree that this was an amazing course. We have learnt quite a lot of new cultures and their style of cooking, which is one of the most important cultural manifestations of nations. Some of us also started to get in touch with cooking as they did not know how to do it correctly. 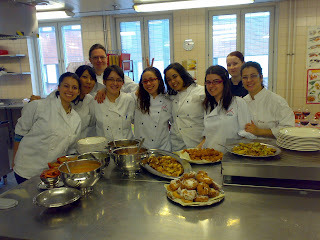 This was also a great experience for them to get familiar with something so basic and helpful in life as cooking is. We have learnt to understand our cultural differences by working together hand by hand and meeting each other. It was a very interesting approach to Finnish culture for foreign students and an approach to the foreign cultures for the Finnish students. On part of the Erasmus students we should say that this was a marvelous course, we really appreciated to learn and have fun at the same time (and practicing some English was also great!). We learnt a lot of vocabulary and expressions, some things about Finnish culture and how to cook! We will recommend it without any doubt! We noticed that every country has interesting gastronomies, we tried different kinds of dishes, so now we think that we know a little bit more of each country, and that gives us a more global vision of our world, it is fantastic!